Thomas Worthington Whittredge was an American artist of the Hudson River School. Whittredge was a highly regarded artist of his time, and was friends with several leading Hudson River School artists including Albert Bierstadt and Sanford Robinson Gifford. He traveled widely and excelled at landscape painting, many examples of which are now in major museums. He served as president of the National Academy of Design from 1874 to 1875 and was a member of the selection committees for the 1876 Philadelphia Centennial Exposition and the 1878 Paris Exposition, both important venues for artists of the day. 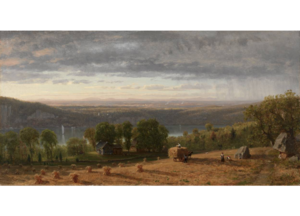 Whittredge also traveled widely and worked in the company of other artists; he toured Switzerland with Albert Bierstadt, and the Rocky Mountains with Hudson River artists John Frederick Kensett and Sanford R. Gifford.